So where exactly are the differences? The 2017 Land Rover Discovery has made its world debut at the 2016 Paris Motor Show. The fifth generation Discovery unveiled in Paris, as expected, looks very close to the Land Rover Discovery Sport but our visual comparison helps you spot all the exterior and interior differences, and what's changed under the skin. The Land Rover Discovery Sport is based on the reengineered version of the Land Rover Freelander's platform, while the fifth-gen Land Rover Discovery sits on the aluminium-intensive Premium Lightweight Architecture (PLA) platform. The Land Rover Discovery is positioned above the Land Rover Discovery Sport. The Discovery Sport measures 4,599 mm in length, 2,173 mm (with door mirrors open) in width and 1,724 mm in height, and has a wheelbase of 2,741 mm, while the Discovery measures 4,970 mm in length, 2,220 mm in width (with door mirrors open) and 1,846 mm in height, and has a wheelbase of the 2,923 mm. The Land Rover Discovery Sport shares the significantly reengineered version of the Land Rover Freelander's platform with the Range Rover Evoque, while the fifth-gen Land Rover Discovery sits on the Range Rover's aluminium-intensive Premium Lightweight Architecture (PLA) platform. 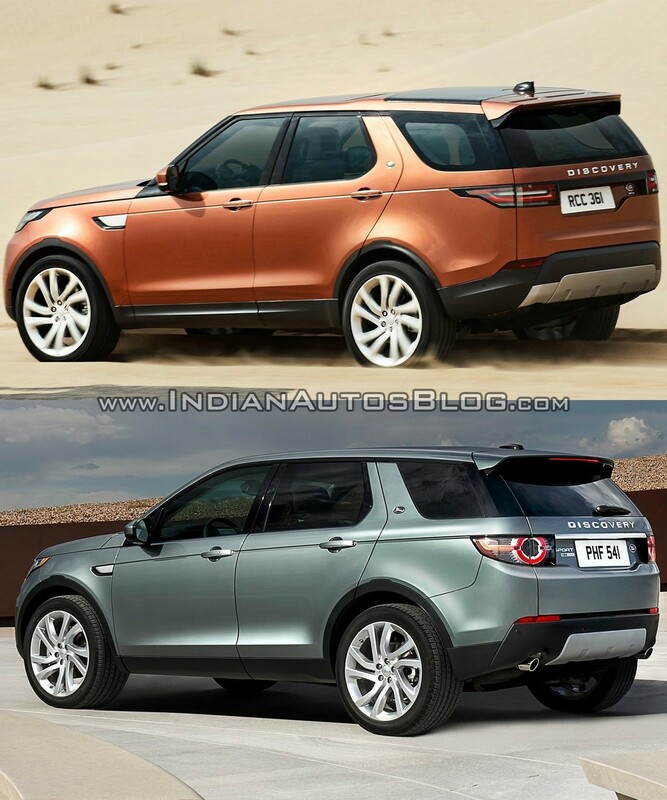 As a result, the new Discovery is up to 480 kg lighter compared to its predecessor. The Land Rover Discovery Sport is available only with four-cylinder petrol and diesel engines, while the 2017 Land Rover Discovery is available with six-cylinder petrol and diesel engines as well. Going under the bonnet, the Land Rover Discovery Sport is available with only four-cylinder petrol and diesel engines. 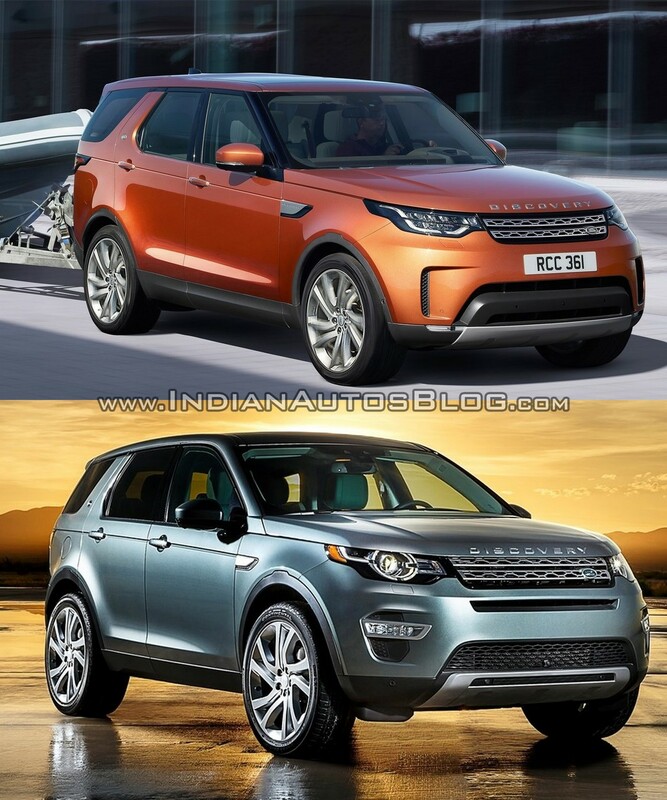 The 2017 Land Rover Discovery will be available with 180 PS (177.47 hp) 2.0-litre four-cylinder and 240 PS (236.62 hp) 2.0-litre four-cylinder diesel engines, as well as a 340 PS (335.21 hp) 3.0-litre V6 petrol engine and a 258 PS (254.37 hp) 3.0-litre V6 diesel engine. The Discovery Sport is available with 6-speed manual and 9-speed automatic transmission choices, while the Discovery has an 8-speed automatic transmission as standard. The Discovery Mk5 will go on sale in Europe in March 2017, with prices starting at £43,495 (INR 37.86 lakhs) in the UK, as compared to the Discovery Sport's starting price of £31,095 (INR 27.07 lakhs).